These pages are in memory of a few good friends of mine. The first section "Helo crash" is in memory of the Marines and Corpman who died in a peace time crash in Pohang, Korea 1989. The next section is in memory of GySgt. 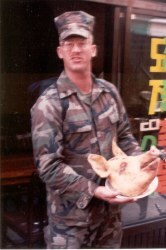 Phil Jordan who was killed in action while serving with C 1/2 in Iraq, 2003. Whether in peace time or in combat when a Marine falls his brothers will carry on. They will continue to carry on with their mission and will not falter. When their mission is complete they will take the time to remember their brother and give him the honor that is due him. On these pages I give honor to two good friends and those that fell with them. Semper Fi Jim and Phil. I will never forget you.